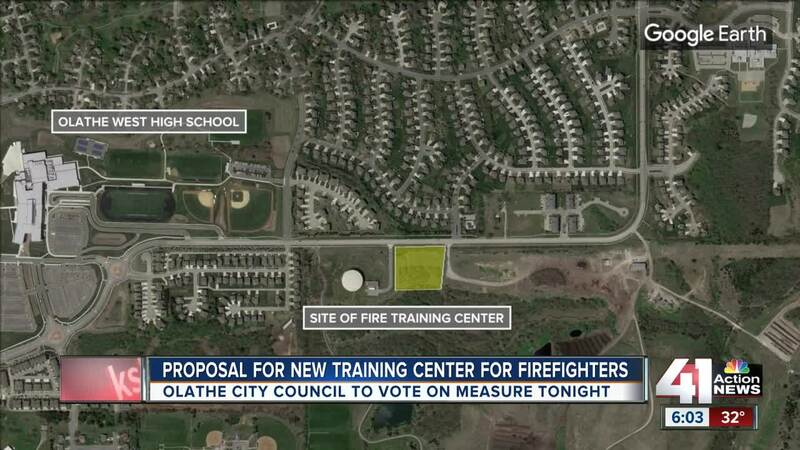 OLATHE, Kan. — The Olathe Fire Department says it has a way to save money and better protect people living in, working in and visiting the city: a new training center for firefighters. The City Council on Tuesday will decide whether to give the green light to a plan to build the facility on city-owned land north of Olathe West High School on Hedge Lane. The city estimates the training center would cost $4 million to build. It would open in the first quarter of 2020, if approved Tuesday. Fire Chief Jeff DeGraffenreid said the center will save money because the department won't have to pay to use training centers in other cities. Olathe could rent the facility to other departments to earn money. The proposed facility would include a burn tower and other areas where firefighters can run through real-life scenarios with fire. Those training exercises help them sharpen their skills so they're ready for any emergency. Olathe West High School houses the district's Public Safety Academy, where students can get a jump start on becoming a firefighter. Building the training facility so close to the high school opens the door to possible collaboration. The City Council meets at 7 p.m. Tuesday to discuss the topic.